Attack On Titan (Shingeki no Kyojin), heralded as the anime series of 2013, is a haunting dystopian series both awe-inspiring and grotesque in its stunning visuals. Humanity is on the brink of extinction due to giant humanoid creatures, Titans (who love humans like a fat kid loves cake), chomping on human entrees- causing survivors to retreat behind huge walls (not unlike the colossal fortification in the North that helps defend the Realm in Westeros against the Wildlings). 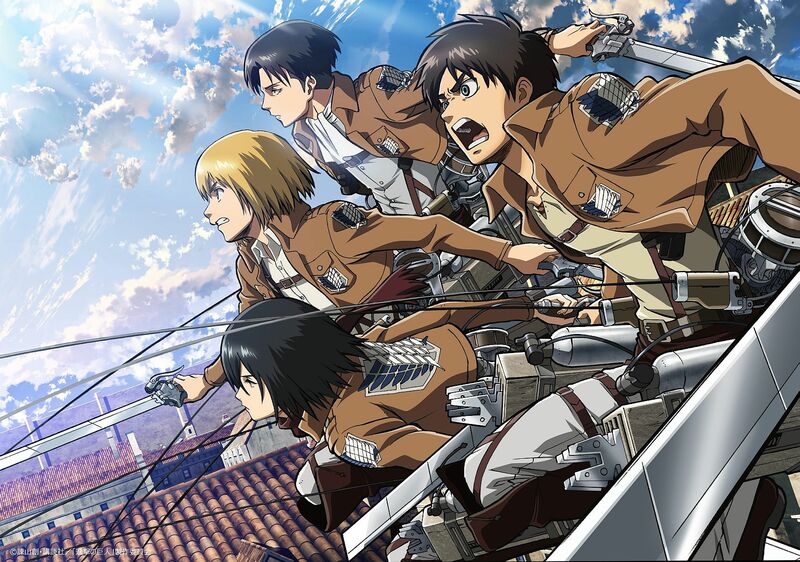 Humanity’s last form of defense are the Survey Corps, which the protagonists hot-headed and vengeful Eren Yeager, brilliant and deadly Mikasa Ackerman, and strategic genius Armin Arler join for reasons that become obvious about five minutes into the first episode- read as ‘tragic backstories101’. Adapted from the manga series of the same name, written and illustrated by Hajime Isayama, Attack On Titan (AOT) is directed by Death Note (2006) director Tetsuro Arak- so you already know going in that it’s going to be a doozy. The series does start off a little slow, and continues to take the ‘long dramatic internal-conflict’ route throughout, once the action starts there’s really no slowing down- you’re intrigued by the end of the first episode and absolutely hooked by the second. The show is gruesome and bloody, but what do you expect from a show about people-eating giants? While the premise is simplistic you’ll find the themes handled in the series to be a grim but complex study on human nature, offering a commentary on the human condition in such harsh realities. When faced with such extremities will humans continue to fight tooth and nail for their freedom or will they lie down and accept a life of being human ‘cattle’? Characters are well-developed and likeable with moments of levity achieved by surprise quirks and excellent interaction. Also, the soundtrack is pretty boss. Collection 1 comes with a 24-page art book and some great extras like the making of AOT, and Japanese production extras. We give it FOUR and a HALF out of FIVE Silent LOLs, for the mere fact that there are moments when you wish the series would speed up a certain character’s thought process. However we’re hanging out for a second season (after of course an English dubbed Collection 2?) and the live-action theatrical movie that’s in the works. If the Titans look anything like they do in this Subaru ad then daaaaaaamn sign us up to see it ASAP. Australian and NZ residents read on for details on how to WIN a Collection 1 Limited Edition, below. Madman Entertainment have FIVE Attack On Titan Collection 1 Limited Editions to give away. All you have to do is answer this question: In 25 words or less, tell us; would you rather be a Titan or a member of the Survey Corps – and why? CLICK HERE TO ENTER, WHAT ARE YOU EVEN WAITING FOR? Comp ends 18 July 2014. However if you miss out you can always buy it HERE, it should still be in stock. Now to wait for Collection 2… JOKES, I’m going to head over to AnimeLab where you’ll find all 25 eps and watch remaining episodes 14-25. Have we talked about how cool this streaming service is? Currently in beta, and free (also ad-free) for an unspecified time, AnimeLab streams over 50 animes in HD with a few being simulcast. It’s also device (mobile, tablet) ready too.